You are reading this article because you want to know about the warning signs of a Heart Attack but before we talk about these signs let us talk about why it is important to know about these signs. Over a period of time the number of heart patients has been increased and the main reason is our unhealthy lifestyle which we continue to follow year after year. We have become so habitual of all these things that we don’t even realize that we are creating a life long damage to ourselves and the generations to come. As per the latest research it has been found that our body start giving us signs and symptoms of heart attack and people often ignore many of these signs and symptoms. So in this article we will cover those symptoms and signs. 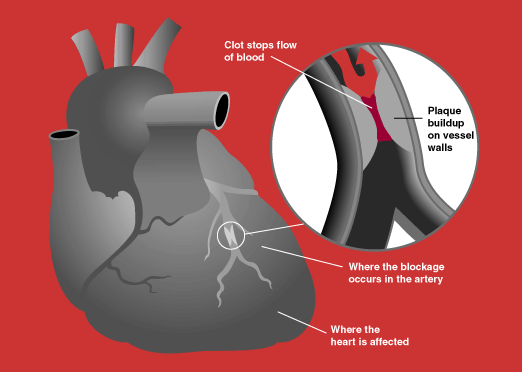 As we have discussed that lack of blood flow can be a reason of heart attack and it has been observed often that people start feeling dizzy most of the times due to lack of blood flow to heart. If you are also feeling dizziness from more than one week than you must visit to doctor because this can be an early warning. In some of the studies it has been found that even a three weeks before the attack some people may start feeling pain in some of the body parts. It has been suggested that you should never ignore continuous pain in you back, arms, shoulders and chest area. If you don’t have any logical explanation that how and why you are not able to sleep properly during nights then it may be an another warning sign of heart attack and you must visit the doctor. Even if you don’t engage much in physical activities and you are experiencing your body under extreme fatigue and you are not able to do your daily chores, you cant focus on your work and you are feeling tired most of the times. Then i must say this is sign that you heart is not able to pump the blood properly. This is an another symptom or warning sign. Again lack of blood and oxygen in your lungs can cause your lungs to stop working properly, due to this you might feel that you are not able to take long breaths and you are feeling difficulty in normal breathing. This is the sure sign that there is something wrong with your heart. At last i would say you must keep a watch on these early warning signs of heart attack and share with your loved ones. Your one share can save many lives. Have you ever experienced any of these signs? Do share with us your personal experiences by participating in the poll or by commenting. Get the job or the reassignment you want! Simply all the information you could ever need! Navigating my way through life and recovery with Bipolar II Disorder, depression, and anxiety.